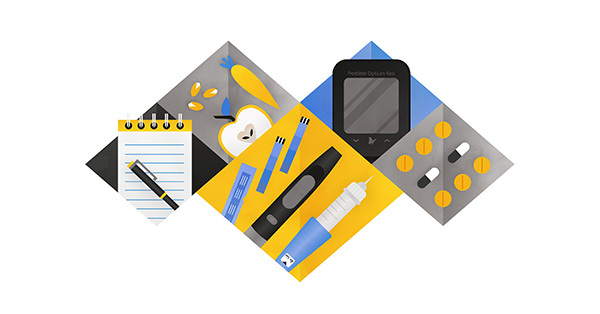 Home > About > News and Views > What’s in your diabetes kit? If you take insulin for diabetes, you’ll know that you need quite a lot of products, equipment and supplies to keep you well and feeling healthy. The items in a diabetes kit will vary to some extent from person to person but here’s a glimpse of what you might need to keep to hand. If you are insulin-dependent, first and foremost, your insulin. It may consist of vials and syringes, pens and cartridges, prefilled pens or an insulin pump and infusion set. You’ll need supplies of needles and a sharps disposal container. You can also get injection aids to help with injection comfort or help people who find the injections fiddly or have poor eyesight. There are also all sorts of accessories for keeping your insulin cool when you’re travelling or out and about, including cooler bags, ice packs and even cute portable mini fridges! However, modern technology has come up with ways to make glucose testing a lot less hassle – and a lot more informative. FreeStyle glucose meters, can act as diabetes logbooks, recording your glucose test results and remembering them. Some meters like the FreeStyle Optium Neo blood glucose meter, can even log your insulin doses and help you spot trends in how your body reacts. Then there is the option of Continuous Glucose Monitoring (CGM) which monitors your glucose levels 24 hours a day without the need for manual finger-prick testing. However continuous monitoring devices can be expensive and, unfortunately, they do not completely replace regular blood glucose monitoring. This is because, to keep them accurate, the devices must be regularly calibrated with a conventional blood glucose meter using finger-prick blood samples5. You should remember to carry glucose tablets, liquid glucose or any similar products recommended by your doctor in case of a hypo. Some people may also use electronic ‘hypo alarms’ which can assist in detecting hypo signs. To monitor your weight, fitness and blood pressure, you may want access to accurate weighing scales, a home blood pressure monitor, a food diary, a pedometer and a supply of your favourite healthy snacks (as recommended by your doctor). If you’re taking oral diabetes medicines, you may need a way of storing and organising your pills, plus any vitamins & supplements you may also be taking. Pill organiser boxes and devices to remind you to take your pills on time are available in a variety of forms. Other types of products that may be useful to you include eye drops for dry eyes, ‘diabetes socks’ that absorb moisture, insoles to cushion your feet, foot cream / heel balm, antifungal cream and any other items recommended by your doctor that may help to keep you feeling comfortable. With so many items to remember, a good kitbag or carry case can be really helpful. Having everything to hand when it comes to diabetes management may make it easier to use your equipment efficiently. *A finger prick test is required during times of rapidly changing glucose levels when interstitial fluid glucose levels may not accurately reflect blood glucose levels, or if hypoglycemia or impending hypoglycemia is reported or the symptoms do not match the system readings. 1. Benjamin EM (2002). Self-Monitoring of Blood Glucose: the Basics. Clinical Diabetes 20(1), pp 45-47. 2. Parkin CG et al (2009). Value of Self-Monitoring Blood Glucose Pattern Analysis in Improving Diabetes Outcomes. Journal of Diabetes Science and Technology 3(3), pp 500-508. 3. Miller KM, Beck RW, Bergenstal RM et al. (2013). Evidence of a strong association between frequency of self-monitoring of blood glucose and hemoglobin A1c levels in T1D exchange clinic registry participants. Diabetes Care 36(7):2009-2014.